This is how you make Noodle Bombs. These are an efficent, and relativley cheap way to create extra ammo for Ultimators or XXL Monster Bazooka's. Enjoy! 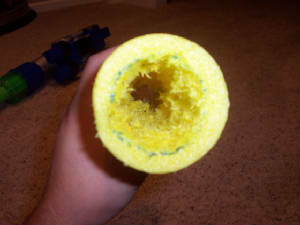 This is a pool noodle. It comes in many different colors and forms. Make sure you get the one that is circular and has a small hole threw the entire noodle. Your first step is to size upp your Ultimator Ballista to the noodle. 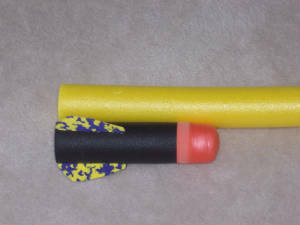 The XXL bazooka's ballistas are slightly smaller, so if you are making replacments for them you will need to make seperate bombs. Next, draw a line where the foam ends on the ballista. Make sure not to make it as long as the entire ballista (including the foamy air part). Now mark it and cut it with a hacksaw. It should cut pretty easily. Now make a mark about an inch out from the end of the noodle. This should be the same size as the Ultimator Ballistas hole. Now hollow it out. This is the hard part. There isn't really a great way to do this. A chisel can shave off a little bit. After you have shaved a bit off try to fit it to the Ultimator Barell. Move it up and down to smoothen the inside of the noodle. 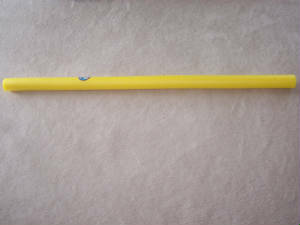 The handle end of a baseball bat works great with this. This is what the thing should look like. You dont have to totally hollow out the other side, but you can if you want. The mark should now be almost fully removed. It may not look pretty, but it gets the job done. Now tape across the top of the noodle. The duct tape should cover most, if not all of the hole. 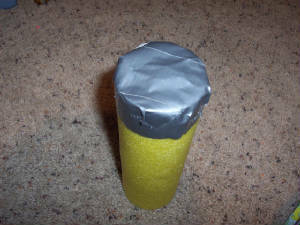 Place about 10 bb's on the top and tape over it with 2 layers of tape. 2 AAA batteries work aswell. This is what the top looks like after the tape. Once you've covered the bb's cover the remaining air holes. After that tape some tape and tape around the top of the noodle. 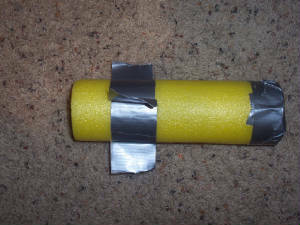 This will keep the other duct tape from coming off. Now for the wings. These greatley increase the accuracy of the bomb. Take 6 pieces of 4-5 inch duct tape and place them together to make a wing. After you've done that make sure you've completed all the steps. 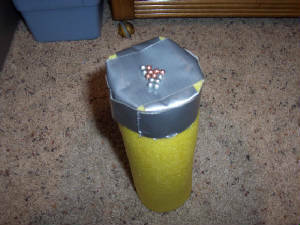 You now have a homemade Ultimator ammuntion, a Noodle bomb. Range is slightly decreased but accuracy is better. 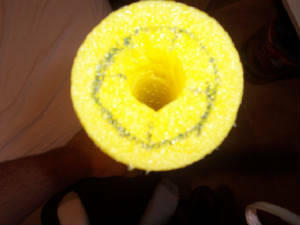 In time the inside of the noodle will form to the barell and fit on better. These cost about .25 cents a piece which is great because Ultimator Ballista's are worth about 4 bucks a piece. Thats a whole $3.75 cheaper!